As artist-educators, we offer a variety of children’s visual art programming that we methodically design and implement for artists age three to twelve. We maintain a deep understanding of the power of the art experience and use this belief to guide our student-oriented curricula. Our programming goes beyond rote learning through monotonous masterpiece reproductions. At our studio, we focus on originality and the development of visual literacy in our contemporary Canadian culture and society. In our dynamic studio, classes are arranged by age with sessions running year-round in the Fall, Winter and Spring. At the Children’s Art Studio Inc., we boast an incredible variety of age-appropriate, visual arts classes beginning with our youngest artists in the Kinder Art program. Our Kinder Art classes skillfully combine literature with art. In this age group, each class begins with a storybook reading, which then becomes the catalyst for art making during studio time. In using this literature oriented approach our students easily identify and relate to worldly themes that then translate seamlessly into their art making. The momentous success our youngest artists achieve by combining literature and art extends into our School Age Art program. In our School Age Art classes we focus on introducing our students to both historical and contemporary artists and their practices. Storybook readings become more biographical and provide students with specialized knowledge of principal art periods and historical movements. 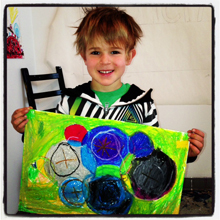 At the Children’s Art Studio Inc., we are ecstatic to pronounce that we actualize this knowledge with experience. As members of the Artscape and Cotton Factory community hubs, our students are fully enveloped in Toronto and Hamilton’s innovative visual arts scenes. Our students experience visits with/from neighboring studios for personalized experiences with our community artists. In addition to our art classes, the Children’s Art Studio also provides further enrichment through our art camps, which run during Winter, March, Passover and Summer breaks. We are also delighted to provide pioneering programming for the Toronto/Hamilton District School Boards and private schools in Southern Ontario. Furthermore, we are constantly active in our community and offer chances to participate in Pop-Up Events for special occasions city/province wide.